The trailers certainly does not do the film itself enough justice as they made me think it was going to be just another cheap horror flick filled with jump scares featuring a blonde babe as the “white virgin”. Here’s the twist — Lights Out is actually, surprisingly, way better than your average horror blockbuster. It has a purposeful story with heart and characters with depth, making it one of the best supernatural-slasher horror films in recent years. 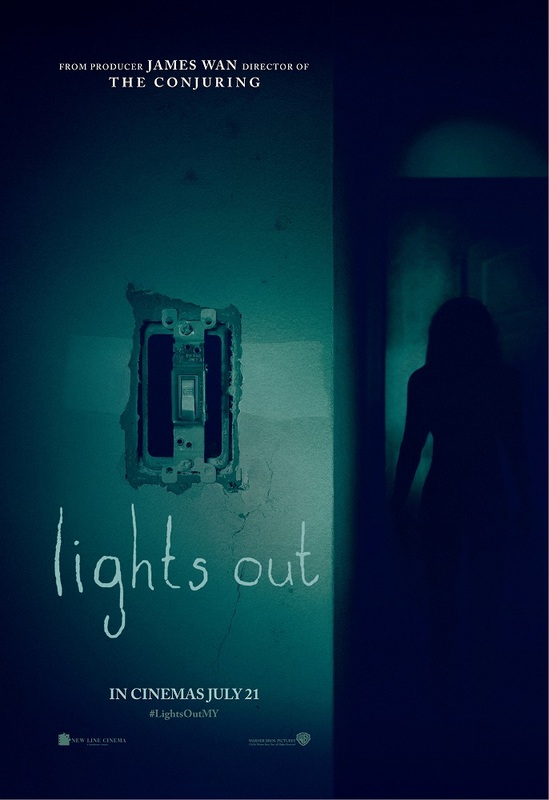 Based on a 2-minute-plus short film of the same name by the same director David F. Sandberg, Lights Out tells a drama about a dysfunctional family that’s haunted by a hostile supernatural being named Diana (Alicia Vela-Bailey) who appears only in the dark. Rebecca (Teresa Palmer) left home after her father has gone missing and her depressed mother Sophie (Maria Bello) has become increasingly difficult to live with, but to help her younger brother Martin (Gabriel Bateman) who’s still under the care of her mother, she has to go back to face the clinging problems of the past which she knows can be life-threatening. Written by co-producer Eric Heisserer (Hours, Final Destination 5), the film’s story is almost as strong and meaningful as Babadook (2014) but definitely more straightforward and less artistic while utilising some cliches of the genre. While the concept of Diana may seem very familiar to those who’ve seen Darkness Falls (2003), first-time feature film director F. Sandberg certainly knows how to play around with the idea to create an utterly creepy atmosphere of darkness, dimmed lights, on-off switches, hints of her looks, and the conveniences of power failure. Sure, the film isn’t blessed with the masterful camera work of its co-producer James Wan (The Conjuring and Insidious films) and it uses a lot of loud jump scares to terrify audiences (one that’s so obvious that it’s coming, I simply had to just close my eyes) but it still works when the movie has an engaging narrative and smarter characters that don’t make unrealistically bad decisions to have themselves killed on screen. Even the heroin’s boyfriend Bret (Alexander DiPersia) is not portrayed as just some a-hole that’s bound to die. Diana can only harm in the dark, but when the flashlight is shone to the front, would Diana attack from the back? Will the flashlight run out of battery? These thrilling uncertainties make every scene in the dark very scary. Diana’s backstory is explained but it’s a mystery how she’s gotten all that devastating superhuman strength and those horrifyingly long nail claws, and why sometimes she can’t automatically disappear in the light like most times. I personally would’ve preferred the original design of the entity from the source material. The horror elements of the film may be flawed or predictable at times, but its story and family drama aren’t. Lights Out could’ve still been a good film without the jump scares. The commendable performances by the main cast are absolutely beyond the standards of general horror flicks as the family drama of the meaningful story demands it. Teresa Palmer’s (Point Break, Warm Bodies) protagonist role is certainly no “white virgin”, that is made clear from her very first scene, but the film also doesn’t sexualise her by making her wearing skimpy outfits while running around, and it’s not that Palmer doesn’t have a great body. Her great display as the troubled rock chick with dilemmas between avoiding and helping her family is matched by fairly new child actor Gabriel Bateman (Annabelle), who plays her young brother who’s in fear, lack of sleep and yet composed enough to understand the situation instead of being a typical child-to-be-rescued of the genre. Malaysian censorship: Surprisingly for a film not classified as “18” here, two of graphic deaths were not cut for the press screening. However, it does look very slightly blurred. Not sure if the actual edit was already like this. Verdict: One of the best jump scare-type horror in recent years.